'Everything comes and goes, marked by lovers and styles of clothes'. I was certainly marked by Joni Mitchell's artistic output, which shaped my musical being and had an incredible influence on my life. As a teenager back in my hometown Montreal, I spent countless hours desperately trying to pick up Joni's tunings. It was not an easy task at fifteen years of age to go around playing that stuff. It's not you like can go to a party and say 'Anyone wanna jam on Hejira?' 'Is there a Jaco around'? It's not quite Sweet Home Alabama. Another dilemma was I could never sing Joni's songs, which moves us ahead about sixteen years to 1995 in Stockholm, Sweden. I was out on the town to hear some live music when I bumped into Swedish recording artist Irma Schultz. At that time I had a crush on her and had to think of something half witty and charming to say as I boldly walked up to her. Just then I remembered reading an article that her favourite artist was Joni Mitchell. Bang! I had my line. So I confidently strutted up to her and mentioned that I was a huge Joni Mitchell fan as well and could play her songs on the guitar with the correct open-tunings. She bounced back by saying she loved singing Joni songs but never could find any guitarist who could figure out what Joni was doing in reference to her complex guitar tunings. So after a couple of months of persuasion she finally came over to my place. I took out an acoustic guitar and we tested the waters on 'Chelsea Morning'. Needless to say 'The sun poured in like butterscotch and stuck to all our senses'. It was such a thrill to finally play our favourite Joni Mitchell songs. That was the beginning our musical relationship and the birth of what would become 'A Bird That Whistles' Sweden's first live Joni Mitchell tribute band. 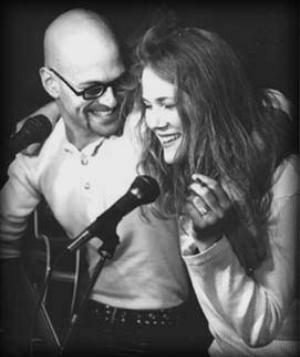 We started playing clubs around Stockholm with Irma on vocals and myself with five guitars on stage, one electric, two 6-string acoustics and two 12-string acoustics, all in different tunings. After several months we added in bassist Anders Kotz and percussionist Ola Swenson to broaden the sonic spectrum and allow us to musically stretch out a bit more. Our performances were like ritual ceremonies. Irma and I felt strongly about creating a good vibe at the shows. We'd always have a table on the stage covered with white cloth, a bottle of wine, fresh flowers, candles and incense. We wanted to create sort of a theatrical, living room vibe. Early, 1996 a friend suggested to Irma and myself we should go into the studio and record a Joni Mitchell tribute album. 'A tribute album'? 'No way'! 'That's too pretentious'. 'We'll get slaughtered from the press'. You just don't go re-recording Joni Mitchell songs. You're walking on sacred ground and can really piss off people. Irma and I were both aware of this and were hesitant. The turning point for us was a weird set of circumstances. I got a telephone call, 'Jack did you hear Joni Mitchell won the Swedish Polar Music Award and she is coming to accept the award from Carl XVI Gustaf, the king of Sweden'? Irma and I thought about it and we decided 'What the heck, lets to go for it'. The timing felt right. We held some meetings with Swedish music producer Kjell Andersson. It was green light. Recording dates were booked at EMI studios, contracts were being drawn up and from a year earlier playing in small clubs just for the fun of it, we were going to record a whole album of Joni Mitchell songs on a major label! The original idea was to make it a simple and organic live album. No fancy session players creating an over produced slick product. The dangerous and obvious route I personally wanted to stay away from. Kjell Andersson, our producer from EMI, felt differently, he wanted something a bit more produced. In the end we came up with a compromise. Half the album was recorded at EMI studios in Stockholm and the remaining live at Lydmar hotel in Stockholm. A well respected jazz club at the time. From our first meeting at EMI studios, with Kjell, Irma, Anders and Ola, it only took us three weeks till the whole album was done. Performed, recorded, mixed and mastered. 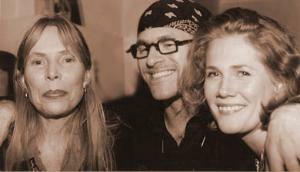 Irma and I met Joni twice that week at The Polar Music Awards in Stockholm, May 1996. First there was a reception for Joni at The Canadian Embassy. We were quite nervous to meet her for the first time, to make an understatement of the year. We had a copy of our newly released album in our hands to give to Joni. Irma leans over and whispers something like. 'Don't look behind you, Joni just entered the building'. It was like meeting Elvis! Thank to the numbing effect of a few gin and tonics we stood in line to meet her. This was quite a formal event. Joni was naturally tired after a dreadfully long flight from Vancouver with a nine-hour time difference. We just chatted a minute and gave her a copy of our album. As she left the party she looked at us and said 'Thank you for the album, I'll listen to it in my CD player at the hotel room'. The next day was the official ceremonies aired live on national Swedish television. Later that night we managed to get on the guest list for the after party. We were really nervous for we knew we might meet Joni again at this party and she might have heard the album and she might have thought it sucked and we might just both have committed suicide that night. OK, a bit of drama never hurt anyone, but we were really contemplating not going to the party in fear of Joni's rejection. Well, I can tell you my two gin and tonics rapidly doubled. Finally, we met an arranger of the event and asked him if Joni was around. He said she was in the kitchen and had asked for us. He took us over there and introduced us to Steve Macklam her manager at the time. We asked him if she'd heard our album. He replied. 'Oh Yea Joni loved it and she was dancing around her hotel room listening to it'. Irma and I nearly fainted of joy. Steve then kindly took us over and introduced us to Joni. 'Hey Joni these are the two who just recorded that tribute album'. Joni lit up gave us a warm hug and from then on Irma, Joni and I were inseparable for the rest of the night. We talked around a table and smoked cigarettes for what seemed like hours and chatted about life, our album, Woodstock, divorce, which Irma was just going through and it was not too long ago Joni divorced Larry Klein, her husband for ten years. I asked her what she thought about the king and she said 'I believe he has moments of clarity'. We covered a lot of ground and she was a warm, funny, charming and lovely lady. As we left the party we couldn't resist asking Joni to take a picture with us and sign the cd's we discreetly brought with us. 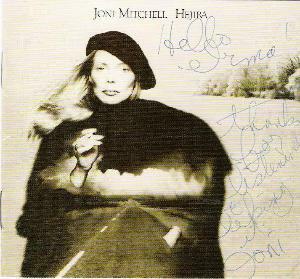 Joni borrowed my glasses and a pen and wrote 'Jack wonderful listening to your tribute album' on one of my favourite Joni Mitchell albums 'Ladies of the Canyon' and on Irma's cover of Hejira ,"Hello Irma! Thanks for listening and replaying it." Irma and I gave Joni a warm hug and thanked her for a lovely evening and off we went. We stood outside the house under the stars and looked at each other. We were on cloud nine. That was it. The end of our Joni Mitchell year. It really was a dream come true for both of us. 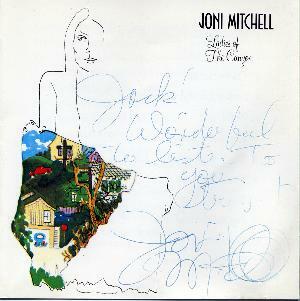 May 2009, The re-release of 'A Bird That Whistles' Songs of Joni Mitchell, EMI. The original release of 'A Bird That Whistles' on EMI was back in 1996. It was never available outside Sweden in any format. 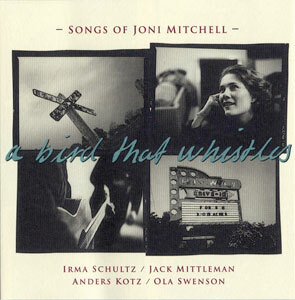 Irma and I are excited and pleased to announce because of our album's presence on the official Joni Mitchell site; EMI Sweden has finally after thirteen years re-released 'A Bird That Whistles' this month and is now officially available as a digital download on Amazon UK and Itunes. This article has been viewed 7,741 times since being added on June 1, 2009.